(Trent Nelson | The Salt Lake Tribune) Law enforcement at the scene of a shootout near 3300 South State Street in South Salt Lake on Monday April 8, 2019. (Trent Nelson | The Salt Lake Tribune) Law enforcement at the scene of a shootout near 3300 South State Street in South Salt Lake on Monday April 8, 2019. (Trent Nelson | The Salt Lake Tribune) Law enforcement at the scene of a shootout near 3300 South State Street in South Salt Lake on Monday April 8, 2019. (Trent Nelson | The Salt Lake Tribune) Law enforcement at the scene of a shootout near 3300 South State Street in South Salt Lake on Monday April 8, 2019. 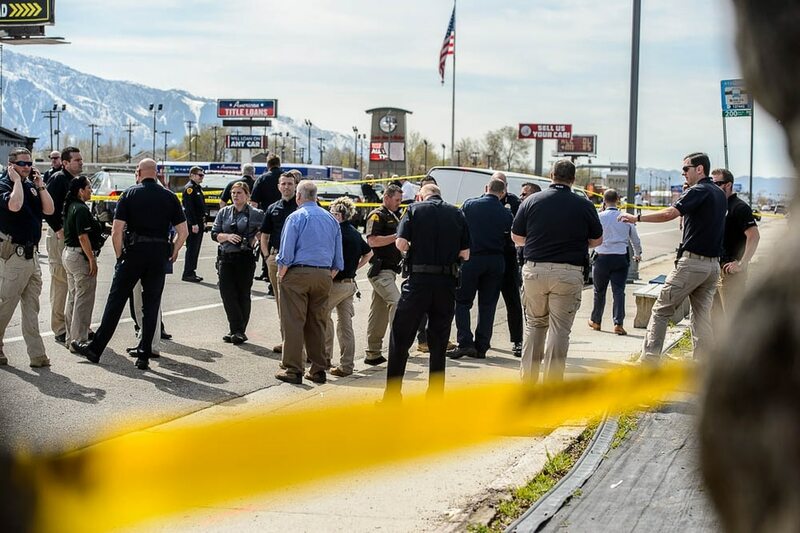 (Trent Nelson | The Salt Lake Tribune) Law enforcement at the scene of a shootout near 3300 South State Street in South Salt Lake on Monday April 8, 2019. (Trent Nelson | The Salt Lake Tribune) Law enforcement at the scene of a shootout near 3300 South State Street in South Salt Lake on Monday April 8, 2019. 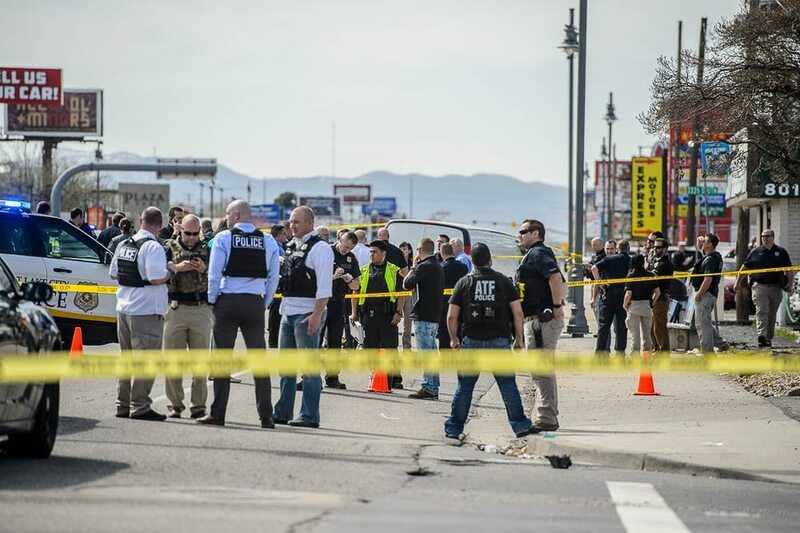 (Trent Nelson | The Salt Lake Tribune) Law enforcement at the scene of a shootout near 3300 South State Street in South Salt Lake on Monday April 8, 2019. South Salt Lake • Tom Mahdi is no stranger to violence. The former tailor for Saddam Hussein’s sister, Mahdi and his family fled their Baghdad home amid war, after learning of possible retaliation against people with ties to the onetime First Family. They were refugees in Jordan and moved in 2009 to Utah, where they started a sewing and alterations shop on State Street and settled into a life of peace. That peace was shattered Monday when a pickup truck crashed into the business’s front door, followed by a hail of police gunfire. Mahdi, alone in the rear of the shop, said he stood paralyzed as rock and dirt sprayed around him. “I just froze,” Mahdi said through his translator and son, Sam Hassan. “It was like the end of the world. A lot of rocks and dirt and very loud booms and everything. I didn’t know what to do back there. ... Me and death — it was just like a hair. Today is like reliving the war in Iraq." Police, who had chased the truck down State Street as the driver shot back at them, called into the window of the shop where it had crashed into the door. “Who’s inside!” Mahdi recalls them shouting. He was pulled, shaking, through the window and onto the ground outside, where he saw the body of the truck’s driver, a man suspected in multiple armed robberies. Salt Lake City police identified the suspect Monday afternoon as Harold Vincent Robinson, 37, of West Valley City. 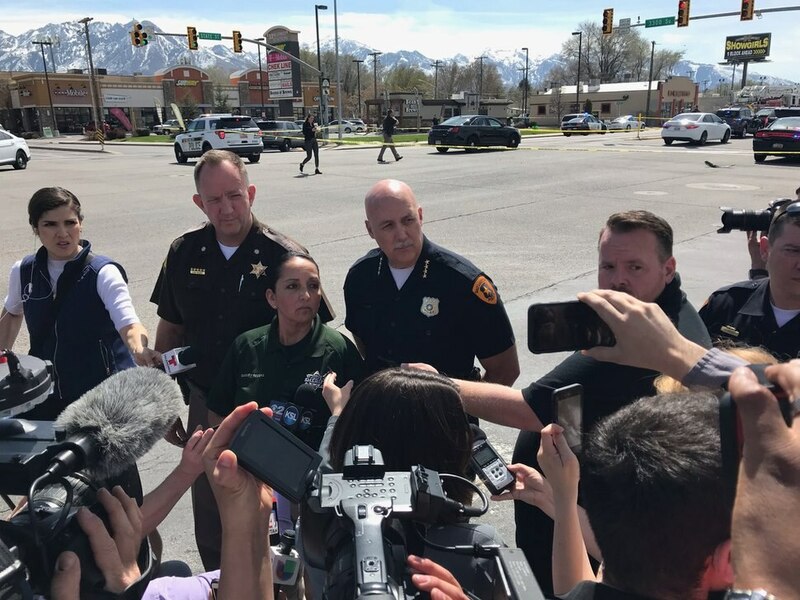 The Salt Lake County sheriff and Salt Lake City’s police chief, in a joint press conference, said there was no indication anyone else participated in what they described as a crime spree that stretched across much of the county and ended at Mahdi’s door. The episode ended with a trail of gunfire from the edge of downtown Salt Lake City to the crash at Princess Alterations, 4 miles to the south. In the aftermath, drivers found themselves snaking through south central Salt Lake City. Intersections down State Street from 500 South to 3500 South were closed much of Monday, as were some intersections to the east — the direction in which witnesses said the suspect was firing out his driver’s side window — while police picked up bullets and shell casings and photographed crime scenes. (Nate Carlisle | The Salt Lake Tribune) Utah Highway Patrol Lt. Col. Mark Zesiger (left), Salt Lake County Sheriff Rosie Rivera and Salt Lake City police Chief Mike Brown answer questions from reporters April 8, 2019, at 3300 S. State St. A suspect in two robberies then fired shots in Salt Lake City, leading police on a chase that ended near this location. The suspect died in his confrontation with police. The first robbery was reported at 10:06 a.m. at a Holiday Oil gas station near 2700 W. 4700 South in Taylorsville, said Salt Lake County Sheriff Rosie Rivera. About a half-hour later, at 10:37 a.m., gunfire was reported in a robbery at a 7-Eleven near 900 East and 3300 South in Millcreek, Rivera said. 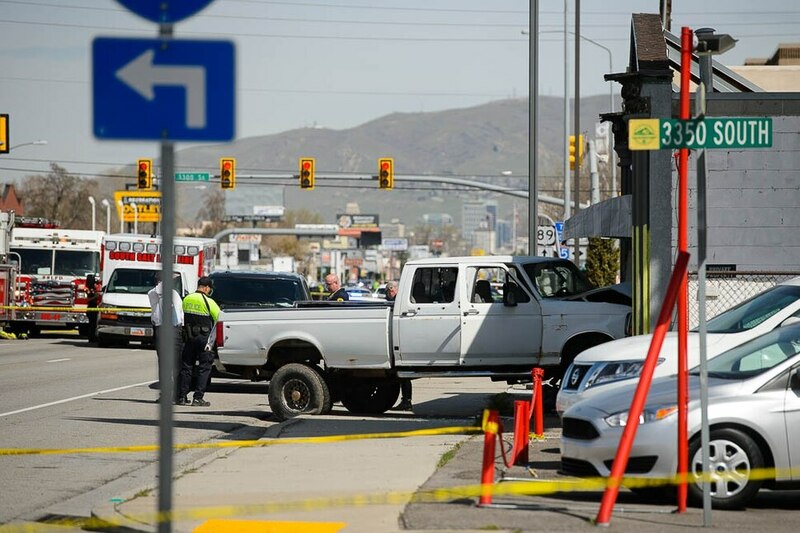 Gunfire was reported again at 10:42 a.m. near West Temple and 500 South, where officers began to chase a white pickup that was fleeing from the scene, said Salt Lake City Police Chief Mike Brown. Brown and Rivera said the driver, later identified as Robinson, was suspected in all three robberies, though it was not immediately clear how he traveled more than 5 miles on busy city streets in five minutes. Robinson has a lengthy criminal record, though many of the charges — including counts of aggravated kidnapping and assault — that date back to 2001 have been dismissed. He pleaded guilty to misdemeanor assault in 2003 and failing to obey an officer in 2012. Salt Lake County District Attorney Sim Gill has begun reviewing the 2003 case, which was filed in Salt Lake City, as part of the investigation into Monday’s events. He said it’s initially unclear why so many of the cases against Robinson, which span several jurisdictions, have been dismissed. Possible reasons can include problems with evidence, uncooperative witnesses or mental health concerns. From downtown Salt Lake City, officers chased the truck south on State Street. Witness Mary Kime said she was driving near 700 South and State Street when she heard gunfire and saw the white truck run a red light, followed by “like 20 police cars.” She continued south as “more police just kept coming and coming,” Kime said. Utah Department of Transportation cameras showed a white Ford, four-door pickup truck leading police on the chase. As the driver of the truck fled south on State Street, he was leaning out the window and firing a rifle at police, Brown said. Police sometimes end chases for fear either the suspect or officers will crash and hurt bystanders. Officers discussed, over the police radio, ending Monday’s chase but decided the driver posed too much of a danger to be allowed to escape, Brown said. After the truck crashed into the alteration shop near 3300 South and State Street, witnesses reported that multiple officers brandished guns and opened fire. Rivera said there were multiple officers from multiple police forces who fired at the suspect. Amad Bilal was near the intersection, he said, when he heard about 40 shots fired. Another witness said he believed closer to 300 shots were fired. Scotty Newman was at Beans & Brews nearby when he saw police cruisers driving one after another on State Street. Robinson died after the car chase, but Rivera would not confirm how he died. A person’s body could be seen under the truck shortly after the crash. There were visible bullet holes in the truck. A UPD officer also suffered a minor injury when the officer was hit by a bullet ricochet, Rivera said. Mahdi said he doesn’t know how many bullets may have entered the alterations shop while he was inside; he said he only remembers the flying rock and dirt. He was pulled out immediately because the smell of gas was coming from the wrecked truck at the door, he said, and he hasn’t been able to return to the shop, which sits between two other business units in the building. Mahdi said he was stunned to find just one body on the ground. He saw a crowd of officers still wielding guns and looking at him. Mahdi said the terrifying day might sound insignificant compared to a war zone — but the shock of violence after finally easing into a peaceful life has left him even more shaken, he said. “We see death over there, but the point is, you’re still alive. No matter how much I’ve lived over there and seen over there — this was different,” he said. Mahdi said he doesn’t know how he’ll reclaim his feeling of peace. Correction: A previous version of this article misstated what day intersections on State Street were closed.